Deadpool learned that it was Betty White's birthday, so he took to social media to wish her a very happy 96th, while posing with a few of the comedic actresses' favorite things. In a recent interview, White was asked about the secret to her longevity and without skipping a beat she said, "vodka and hotdogs," which is definitely a program that Deadpool can get behind. One would imagine that the superhero probably celebrates with the same party favors that Betty White embraces and probably a lot more often. In typical Deadpool fashion, the birthday greeting is pretty funny and could easily be turned into a birthday card for just about anybody of legal drinking age. 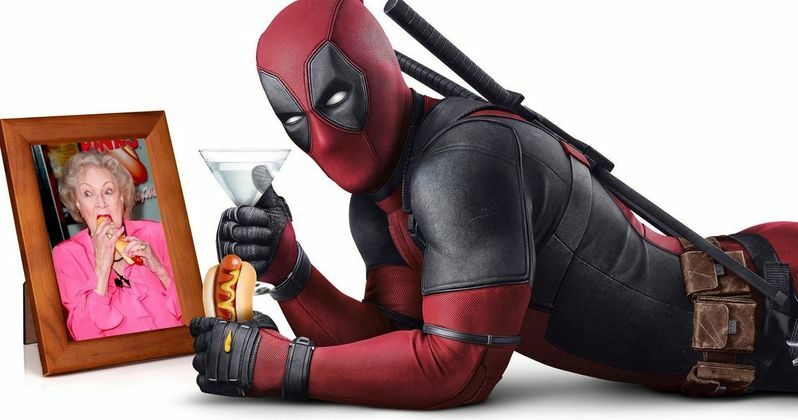 The image, tweeted from the Deadpool Movie Twitter account, features the Merc with a Mouth laying down while toasting to a picture of Betty White eating a hot dog. He is seen with a martini cocktail glass in one hand and a hotdog in the other while offers a special birthday message. Deadpool, who it should be noted named his swords after Bea Arthur had this to say. "Happy Birthday to the one and only Betty White. Cheers to another year of 'Tinis and Weenies!" Hotdogs and vodka aren't the only things that Betty White attributes to her longevity. The Golden Girls actress also tries to keep a positive mind set, noting that negativity just bogs people down and gets in the way. In addition, she also offered advice to aspiring actors, telling them to treat it like a business and work as hard as possible to achieve a goal instead of just expecting it to fall out of the sky. The advice is worth taking since Betty White has seen a lot in her 96 years as well as her 70-plus years in show business. Deadpool 2 wrapped production late last year, so a trailer with more than a few seconds of snippets from the movie is overdue and fans are beginning to get restless. We've been teased with a Bob Ross spoof that literally showed off a few seconds of footage, but that's all that we've seen from Ryan Reynolds and crew. The trailer should also be a more pressing matter now that the release date of the movie has been moved up to a May 18th release date, which is fast approaching. It sure looks like Deadpool and Betty White could hang out together with their shared interests of wieners and hard liquor. Deadpool might have a little bit of trouble with the positive mental attitude stuff, but the vodka will undoubtedly take care of that matter after a few shots. That already sounds like a pretty interesting party that might not be suitable for any audience, ever. While we continue to wait for that Deadpool 2 trailer, check out the Merc with a Mouth's heartfelt birthday greetings to Betty White on her 96th birthday below, courtesy of Deadpool Movie's Twitter account.